Shrewsbury Town boss Micky Mellon says the elevation of teenage defender Dominic Smith to the first team is proof that the League One club's youth policy is working well. The 19-year-old's form, together with the arrival of Zak Whitbread, has allowed Mellon to loan centre-back Mark Ellis to Carlisle for a month. "It's a line of recruitment we have to be good at," Mellon said. "Hopefully if can keep bringing players like Dom through, we can get better." Mellon watched Shrewsbury's youth side beat Telford on Tuesday, with new professional Ethan Jones among the scorers. He continued: "We're very keen to keep bringing players out of it, so I've got to be aware of them and it's good for them to know the manager is watching. "We can't go and compete for players with big transfer fees." 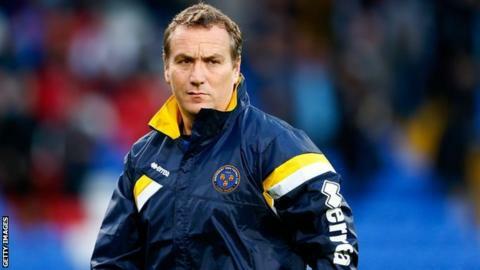 Shrewsbury travel to Port Vale on Saturday with both sides three points clear of the relegation zone. A 2-0 home victory over Bury on 24 October followed back-to-back defeats for Town. "They're been steadily improving for a while, we haven't got the results we've deserved," said Mellon. "There's still things to improved on but we're getting there. I'm pleased with the progress."